Several polling location changes in effect for Nov. 4 election. To shorten lines, residents urged to review Ballot Questions in advance of voting. Tuesday, Nov. 4, that polling locations have changed for six of the City’s 21 voting precincts. Affected voters have been mailed appropriate information and instructions. However, if you are a voter at one of the following locations and need additional information or have not received a postcard, please call the Somerville Elections Department at 617-625-6600 extension 4200. • Ward 1, Precinct 2: Moved from the East Branch Library to the East Somerville Community School (Glen St. entrance). • Ward 1, Precinct 3: Moved from the Reilly-Brickley Fire Station to the East Somerville Community School (Glen St. entrance). o Please follow signs with the GREEN DOT. • Ward 3, Precinct 2: Moved from the former Cummings School to the Somerville High School Atrium (gym entrance). • Ward 4, Precinct 2: Moved from the Reilly-Brickley Fire Station to the Winter Hill Community School, 115 Sycamore St.
• Ward 6, Precinct 2: Moved from Ciampa Manor to Somerville Community Baptist Church, 31 College Ave.
• Ward 7, Precinct 2: Moved from the Teele Sq. Fire Station to the West Somerville Neighborhood School (Raymond Ave. entrance). To review or determine your polling location, visit http://www.somervillema.gov/residents/address-lookup. 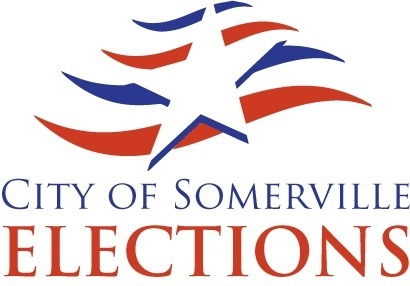 The Somerville Election Department reminds all residents to familiarize themselves with the 2014 Ballot Questions prior to arriving at polling locations. Each of the questions appearing on the Nov. 4 ballot have impacts to all residents of the Commonwealth in some way, and materials provided by the Secretary of State’s Office will help to alleviate confusion or questions about each ballot question. Additionally, understanding the information in advance can help to reduce wait times at polling locations on Election Day. • Informational booklets at Traffic and Parking, 133 Holland St.
For more information on the ballot questions, or general Election Day information, please call 311 (617-666-3311).